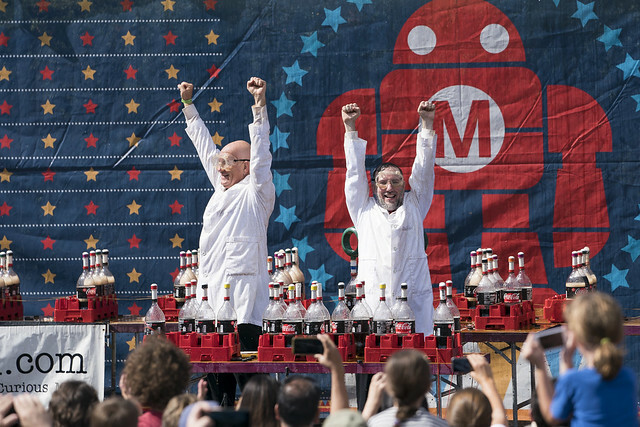 When you’re a maker, Saturday morning can be the toughest day of Maker Faire. Often you have lots of booth preparation to finish, parking is a hassle, you’re usually pretty beat from the night before or from travel (or both), and you’re anticipating the crowds that will descend. There is a kind of frenetic energy to Saturday morning as we all brace for the day. First superhero of the day at World Maker Faire NY 2018. And then at 10 am, the crowds come in, you stumble through your first couple of interactions with the public and before you know it you’re rolling… and rolling… and rolling… straight on through to 6 pm. Whew! Making Pool Noodle launchers at World Maker Faire NY 2018. Every superhero needs a good disguise. Masking making at World Maker Faire NY 2018. Making Marshmallow Minions at World Maker Faire 2018. If you’re lucky, like me, you have a big crew of amazing makers with you to man the table, so you can get out and see some exhibits and sit in on some talks. The kids take over the table at World Maker Faire NY 2018. Saturday had a lot of amazing highlights. Probably the most buzz was for Adam Savage an the Mybusters, Jr. cast, with good reason. The new show is hotly anticipated in the maker community, the junior Mythbusters are brilliant kids and Adam is basically, a god. What’s not to love? But there are many presenters yesterday and lots of workshops as well. There were talks about the maker movement in general, about specific projects, about various trends and personal stories of making. The diversity of the topics is pretty amazing. Tanya Fish explaining how she created RFID light up fingernails. Expert Maker panel Q & A with Lenore Edman, Matt Stultz, sophy wong, and Jimmy DiResta. Of course I was also lucky enough to do a very short presentation at the Make Membership Table about “Making Everywhere.” I wanted to encourage makers to get out into their communities and share at local events. Take a look. And the diversity of projects is stunning as well. Fantastic cosplay, giant robots, hand-crafts, steampunks, tiny houses, 3D printed chocolates, homemade race cars, drones, break dancing, fashion and more are all in play. It’s a truly stunning testament to the capacity of human creativity. And that, of course, is why we all love Maker Faire. It inspires. It challenges us. I gives us the opportunity to meet others who love what we love. It creates a community of people who just excited to explore new things and build the future. Anyway, I was glad that, other than a run to Home Depot to restock some supplies, Saturday was an easy night for us all. The crew went back to our rented house, made some dinner and got some rest. There is nothing quite as restful as a glass of wine, yoga, beating things up in a video game, and then an early bedtime. Can’t wait to see what Sunday brings! Stop by our table. We’re in the Kids Zone, Zone 4 up on the hill.